Laura Muir remembers watching Kelly Holmes race to an Olympic double in Athens and recognising the feat as something special. 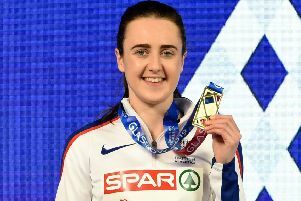 Those memories have helped fuel the Scottish athlete’s own desires ahead of Rio 2016, where she hopes to build on last year’s World Championships, where she came fifth in the 1500m. Still only 22, she has made a name for herself, bouncing back from a troublesome 2014 to earn the title of Scottish Athlete of the Year 12 months later. That has given her a platform to build on and, having given up Christmas at home to concentrate on racking up the miles in some warm-weather training, she has returned to Scotland to fine-tune the speed before she swaps indoor events for the real business of the outdoor season. One of seven Scots who will compete in the Glasgow Grand Prix at the Emirates Arena this weekend, she will be testing herself in a high-calibre 800m. “I was altitude training in South Africa which was a great experience and I got three really good weeks’ training that weren’t hampered by the winter weather, which was really good,” she said. “I think I’m in the best place I could be. My cross-country results showed that my endurance was good through the winter and now that I’ve run a couple of good times over 800m my speed is there as well. Both sides of the spectrum are looking good and I’ll have to build on that for the summer. “It’s going to be a really top-class field so I’m looking forward to getting out there. It will be good experience and a chance to see where I’m at. The indoor season has been good for Scottish athletes, with Lynsey Sharp also starting the year brightly, and that is a source of encouragement, not just for Muir, but for all Scottish athletics, according to the part-time veterinary student. A world-class event, the grand prix will be an opportunity for more Scots to emerge from the shadows, as well as a chance for Scottish fans to get a close-up of household names. Andrew Butchart will run in the men’s 3000m, while Steph Twell and Josephine Moultrie will compete in the women’s event. Zoey Clark and Sarah Inglis get experience over 400m and 1500m respectively, and Guy Learmonth races in the men’s 800m. They will be joined by a world-class field, including Olympic and world champions Mo Farah and Greg Rutherford. “There’s so many big names coming in all the events so it will be great. I love competing on home soil and it’s not often you get to do it in such a big competition,” said Muir. “It’s the biggest competition in the world for indoor meets so I’m really looking forward to it and it’s a great line-up. This weekend’s meet will be Muir’s final indoor race. Then she will refocus on training and doesn’t plan to race again until late May or early June. “I guess the main focus ahead of Rio will be the British Championships because that will be what cements my selection for the Olympics,” she added.